Can you imagine a time before the smart phones that we all carry now? There was no calling or texting people at all hours of the day. And getting directions was not as easy as just typing an address into your phone. Back during those pre-smart phone days, I got a promotion that required a move from Indiana to Kansas City. I had never been to Kansas City before. I didn’t even pick out my apartment; my job provided it. I used a website called MapQuest to print out directions to get me there. As I made the drive, it started to rain a little bit. As I got closer to Kansas City, the weather turned into what felt like a hurricane. I could barely see anything through my windshield. First I didn’t really know anything about where I was going, and now I was caught in a storm. Just as I thought things couldn’t get any worse, the highway that I was supposed to use to get to my apartment was closed due to construction. I was lost and didn’t know what to do. Through what felt like sheer luck, I found a convenience store, and the clerk helped me and gave me another way to go. Without his kindness, I would probably still be wandering aimlessly. My family’s spiritual journey has been like that drive. We started out going to a church in Oklahoma City. We went most Sundays, and everything seemed okay. We rarely did anything with the church on any other days, and I honestly don’t remember having any meaningful conversations with any of the other members of the church. We never felt like we were part of something bigger. Our weekly visits slowly changed to every other week, then once a month. We eventually stopped going almost all together. We were lost. A year ago, my wife’s brother mentioned his church and how much he liked it. He invited us to One Church a few times, but we never thought too much about it. Then, one day we decided to visit. We felt moved to try it, but we were scared because we didn’t know anything about this church or any of the people. Also, the church was about 30 minutes away, which was a big investment of our time. Immediately when we arrived, our apprehension started to disappear. There was someone at the door to greet us. When we walked in, it was obvious we had never been there before. This wasn’t an issue, though, because people instantly started to talk to us and ease us in. The pastor even took the time to come over and introduce himself and meet our whole family. As we found our seats, the band started to play. It was amazing to hear contemporary music at a church. During church in the past, the kids would constantly ask me how many more songs until church was over (this was code for, “How much longer are we going to be here?”). This didn’t seem to be a problem anymore. We have experienced so many changes in this past year. We joined One Church on April 27, 2018. 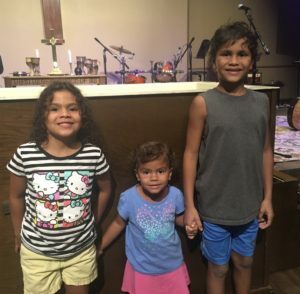 I was baptized, as well as 3 of our kids. We now share daily Bible readings and devotionals together as a family. My wife and I attended Alpha, where we met a group of friends whom we continue to share and grow with. Now we are all in Disciple Bible Study together. Our daughter Alyssa is going through Confirmation this year, which brings us back to the church on Sundays. The younger kids get another lesson with Megan, the Children’s Director, and Erica and I have become a part of the Faith Builders class. Every time we try something new or join a new group within the church, we grow even more in our faith. Now, our kids ask, “How many more songs?” because they love the music. 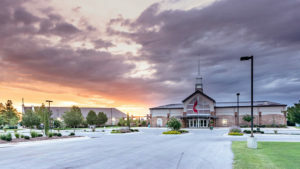 At One Church, they are ecstatic because they don’t have to sit around the entire time. They get to leave and be with other people their age. They learn the message in a fun, exciting way. We loved the first service we attended and have been back every week since. 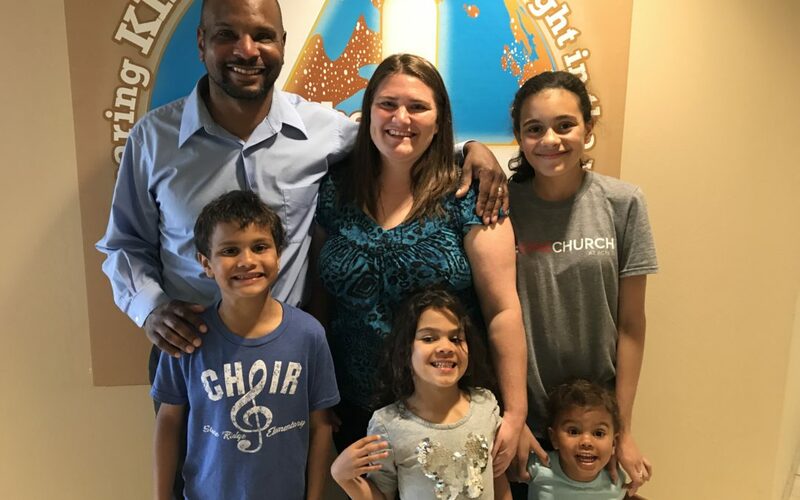 Madison says that Friday is her favorite day of the week because it’s “church day!” We consider ourselves part of a church family, and that never seemed possible. It is hard to believe how far we have come in just one short year. It seems hard to imagine how we ever survived without smartphones and gadgets now that we use them for so much, but that’s exactly how it feels for us now that we have found One Church. It seems impossible to live without it. For so long we were lost, we didn’t know how we would find our way. Eventually we stopped trying to find our way and let God show us the way. Looking back, I know it was God telling us it was time. Once we stopped trying to control everything, He led us to something greater than we could ever imagine. We are so blessed to be a part of this wonderful community. Happy birthday, One Church!